Rhema grew up in Chiswick, a small town in London, England, and attended Coventry University to study English and Creative Writing. Throughout her university years, Rhema has worked in various administrative roles and has developed a passion for administration. 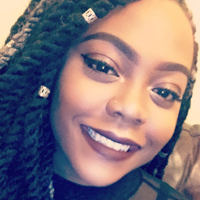 As an English graduate, Rhema has taken pride in her writing and proofreading abilities and hopes to showcase them at APR. Rhema’s hobbies include a lot of reading, scriptwriting, attending concerts and cheering for the New England Patriots.